Each section of Sorensen’s well-organized poetry collection bears its gracefully appointed epigraph. (She quotes Eliot, Pound and Kafka). I enjoy reflecting on how her appreciation of these early 20th Century romantics, and her experience of Colorado floods, have influenced her work. There is a prominent strain that flows through these poems: the deep, roiling rumblings of loss, and loss of a child, in particular. Perhaps this is only a poetic persona, I tell myself, but reading through the volume I become convinced, sadly; the poet has suffered real, personal loss. Indeed, had she not included her “Poem for a Surviving Son” (p.66), I’d have wept. In light of this, Sorensen’s work is all the more commendable, and even comforting. She has plunged, but she has risen soundly to the surface. As the title suggests, many of the poems are concerned with the river and its forces. I asked my son: Where have you been? …Now, is not the time to play. “This Once” is a representative poem amidst others of poignant description. One such, “White Woods,” (p.35-36) is an ekphrasis after a Van Gogh painting that depicts a late-summer experience: “I found wild blackberries, rowan berries, / stuffed them into my mouth / like a child, / pressed my tongue down / to release the slightly bitter juice…” The poem continues: “There was no sudden experience. / Decomposition is so quiet…” And concludes: “I pushed the scent away, / found my own path out / of the white woods.” Here the mood and the sensual are so well blended. Section II includes the eponymous “Mary’s River.” (p. 49-50) Within it, we ride a helicopter looking down on drownings, on rushing waters that flush arms and legs along muddy embankments. The poem, in spite of its shocks and horrors, speaks of love, repentance, and mercy, as if Mary Magdalene were soothing us. “What the Snow Brings Sestina” (p. 51-52) affords no solace, however. The poem is a startling disclosure of the death of a man frozen in the snow. written in a loose sestina form. Though the end-line words do not adhere strictly to the form, we enjoy the poet’s admirable aesthetic control. I expected the final section to be the most enjoyable, but I found satisfactions almost uniformly throughout the volume. 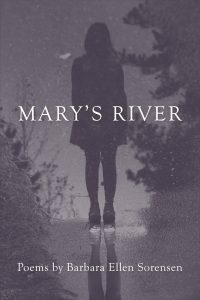 For all the heaviness of its themes, Mary’s River is not maudlin or thinly ponderous but presents its own rich world of hope; this, in spite of loss and nature’s devastations. Sorensen accomplishes her art with a sure poetic hand: wise, poignant, and reassuring. Carole Mertz, poet and essayist, has reviewed for Mom Egg Review, Arc Poetry (online), Copperfield Review, CutBank, Dreamers Creative Writing, Eclectica, South 85 Journal, Quill & Parchment, and elsewhere. Her recent poems are in Eclectica, The Ekphrastic Review, Front Porch Review, WPWT, and other literary journals. She lives with her husband in Parma, Ohio, where she teaches music.